How did the comedy of Cree funny man Don Burnstick connect a Laurier student with her ‘second family’ and a passion for research? 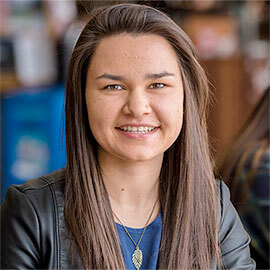 In the fall of 2010, Liz McLeod, an Aboriginal student from Moose Factory, made the 800 km trek to Laurier’s Waterloo campus to begin her undergraduate degree in Kinesiology. During McLeod’s second year of studies, she visited the Aboriginal Student Centre (ASC) to pick up tickets to a comedy night with Cree comedian Don Burnstick – a favourite of hers who was performing at the centre’s grand opening event. It was there that McLeod met Melissa Ireland, the Aboriginal student support coordinator at the Waterloo campus, who gave her a tour of the ASC and explained the centre’s vision, resources and supports for Aboriginal students. Under the direction of the Laurier’s Office of Aboriginal Initiatives, the ASCs on Laurier’s Waterloo and Brantford campuses offer academic resources and cultural programming to Aboriginal students while educating the wider university community about Indigenous issues. The ASC also introduced McLeod to a research opportunity that would change the direction of her life and studies. Passionate about empowering Laurier’s Aboriginal students, Ireland encouraged McLeod to apply for an Undergraduate Student Research Award (USRA) offered through the Natural Sciences and Engineering Research Council of Canada (NSERC), which encourages undergraduate students to conduct research in the natural sciences and engineering and to consider pursuing graduate studies. With her USRA funding in place, McLeod undertook a four-month research position with Stephen Perry, a professor in Laurier’s Department of Kinesiology, during the summer of 2013. Working with Perry as her supervisor, McLeod investigated and tested balance-enhancing insoles to improve gait and stability in older adults. Perry is well known for his research into human movement and translating his findings into interventions for preventing falls among older adults by improving shoes and insoles. With a newfound passion for research, McLeod chose to stay on at Laurier and pursue a master’s degree in kinesiology. McLeod, with support from Ireland and the Office of Aboriginal Initiatives, successfully applied for grants available to Aboriginal students, helping her raise sufficient funds to join Perry and a team of Laurier researchers at the 2015 International Society for Posture and Gait Research World Congress in Seville, Spain. McLeod encourages other Laurier students interested in research to attend conferences, large or small, as they provide opportunities to network with others and broaden their knowledge base within their field of study. “It took a lot of work to get to the conference, but it was worth it,” she said. McLeod expects to finish her master’s degree in August 2016. With the means to seek full-time employment in the near future, McLeod is confident that the skills she acquired at Laurier have prepared her for success within her field.